Almost two months after Donald Trump’s election victory, investors’ frenzy over the president-elect’s policies is finally experiencing a reality check. 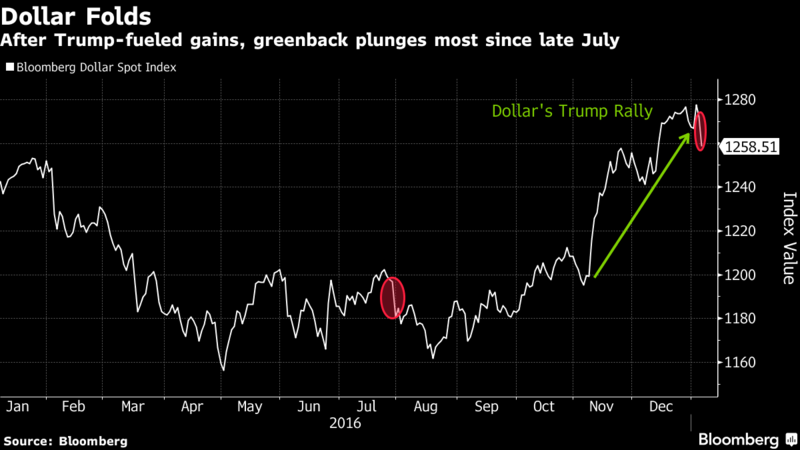 The dollar’s biggest two-month rally against the yen in two decades came to an abrupt halt Thursday, with the greenback slumping as much as 1.7 percent. Several triggers fueled the slide, including China’s central bank muscling into the funding market to support the yuan, as well as improving economic data from China and Europe juxtaposed with U.S. figures suggesting the job market may be softening. So far, the retreat has merely served to put a dent in the dollar’s surge since Nov. 8. But it raises the stakes for the monthly U.S. payroll report due Friday, which will force investors to square the actual health of the world’s biggest economy with optimism that Trump will achieve a platform of fiscal expansion that adds to the growth momentum. The dollar dropped 1.5 percent to 115.49 yen as of 12:19 p.m. New York time, the biggest retreat in more than five months. Its 11 percent rally in the last two months of 2016 was the biggest since 1995. One reason for dollar bulls to take heart: U.S. real yields have more than doubled against Japan’s since the U.S. election, suggesting that a fundamental gauge of the greenback’s worth is on their side.